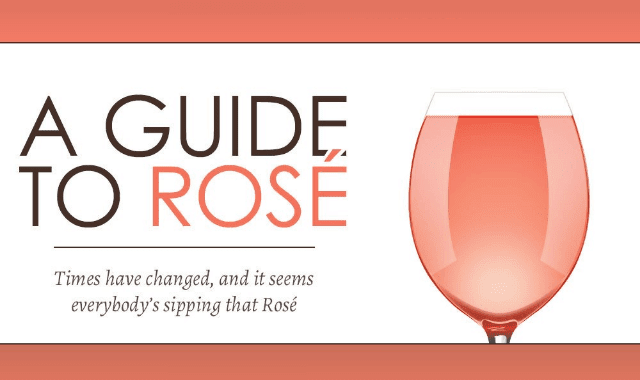 A Guide To Rosé #Infographic ~ Visualistan '+g+"
While historically there is nothing new about rosé, the modern novelty and virtual controversy has turned this delicate wine into a hotly debated subject. With the market for rosé booming and it’s main consumers women aged 21-35, it’s no wonder the attention it has attracted. So what is it about rosé that makes us love it, or makes us love to hate it? Most rosé wine has a range of alcohol content from 11%-13.5% ranking it among other wines of medium ABV like Bordeaux and Riesling, though many Americans would consider rosé to be more on the lighter side. What is sometimes considered a refreshing and almost juice-like wine can actually pack a punch after a couple glasses. Within the ranges of alcohol content there are also many varieties of rosé style wine in countless shades of pink. In fact some rosé sports such a deep and saturated color that it can often be mistaken for a red wine. Rosé wine production methods have been in place for thousands of years, as the production itself has been constant since before the time of the Holy Roman Empire. Provence, South France marks the birthplace of rosé and remains the highest producer of rosé in the world, but for the highest consumption you’ll have to fly across the ocean to the big apple. How do you prefer your rosé wine? Take a look at this infographic from Sonoma-Cutrer for more about rosé, its varieties, production process, and even its cultural implications.